Calendars inspire every day of the year. 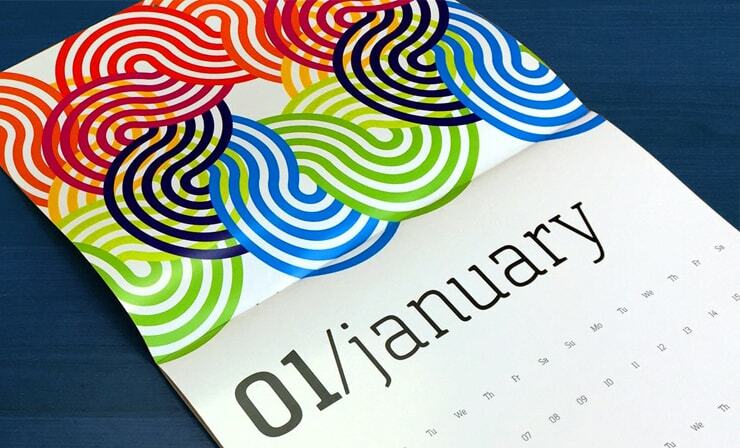 A smaller calendar that lends itself to marketing and advertising for businesses and start-ups companies. Feature sale dates and photos of key products. Medium-sized calendar that is ideal for event commemorative gifts, wedding, reunion and birthday gifts featuring photos of special moments. 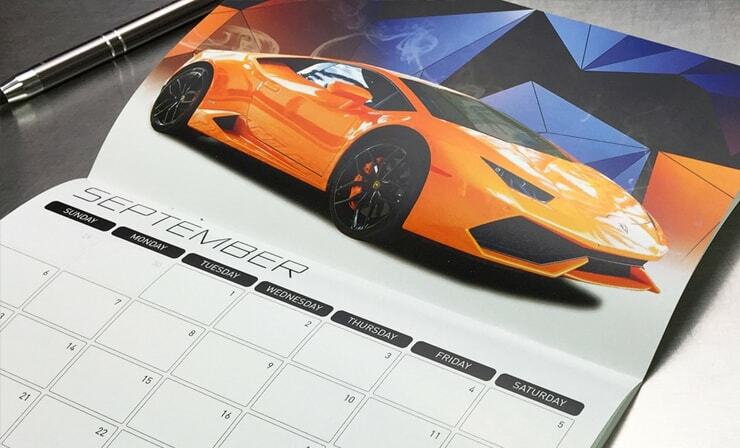 Large, standard calendar that features large photos. Great as a branding tool, photography and illustration catalog. Include important dates and deadlines. Pages are stitched together through the fold from the outside and stapled between the centermost pages. Most popular type of binding. Hole-punched and bound by a wire spine, allowing the booklet to open and lay completely flat on a desk and a 360-degree rotation of bound pages. Bound by a plastic coil, allowing a booklet to open flat on a table and offer 360-degree rotation. Durable and light-weight. Extend all images to farthest edge of the template. The template size is 8.75 x 5.75". This line shows exactly where your card will cut. The trim down size is 8.5 x 5.5". Type should not extend beyond this line. The measurement is 8.375 x 5.375". Each page should be set up according to these specifications all in one pdf file or indivual page files. Do not submit spreads. If the cover is a different paper stock than the body download this template as well. Extend all images to farthest edge of the template. The template size is 8.75 x 8.75". This line shows exactly where your card will cut. The trim down size is 8.5 x 8.5". Type should not extend beyond this line. The measurement is 8.375 x 8.375". Type should not extend beyond this line. The measurement is 8.375 x 10.875".